today was my mother's birthday. i left my house at noon to take the t down to central square to get her some flowers (i also had to buy something from pearl's, the young man behind the cash register wore an intriguing half shirt that i wanted to ask questions about but decided it was better not to), then i subway-bused my way to the cafe. unfortunately she wasn't there yet, so i drove the car back to belmont to deliver her present, a bouquet of yellow marigolds. i got a chance to walk around the snowy backyard (wasn't i just here last night? ), dabble in some of that wintertime nostalgia, one of the things i miss most about not living in belmont anymore. the only things green were the evergreens, the honeysuckle hedge, and the bamboos. 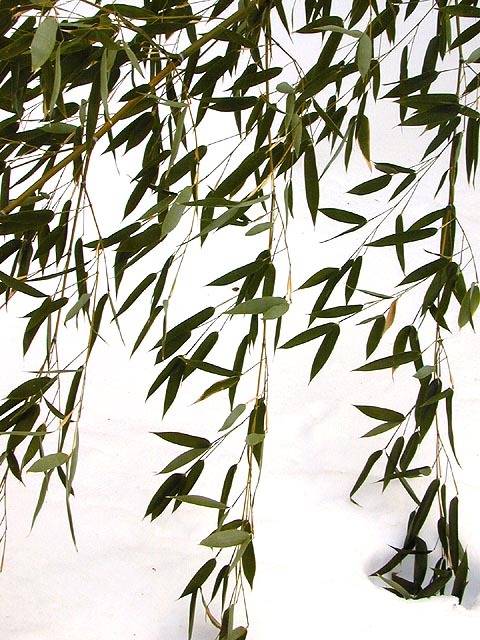 set against the white snowy background, the bamboos looked like chinese paintings. when my mother went to work, i got a ride back to cambridge. she came in for a little bit, i made her some belgian waffles, one of the rare times when i actually make something for my mother to eats. when she left i made some phone calls and did some work. last night while reading up on my epidemic diseases (typhoid, smallpox, syphilis), i came to the realization that ever since i became unemployed almost half a year ago (holy crap, placed in that context, it seems like a long time, but actually 180 days went by rather quickly), I HAVE NOT BEEN SICK ONCE. there might've been times when i'd had maybe a runny nose or a slight cough, but never more than a day, and it usually went away with no wear for the worse. i know friends who've gotten sick this season (julie, eliza), and i guess i'm lucky to have escaped disease thus far. i think the most obvious reason is that i haven't been out very much since the lay off, pretty much holed up at my place, very little social contact. i don't ride the t on a regular basis anymore, which i think is a very good place to pick up a stray virus or two. say what you will about being a hermit, but at least i'm not getting sick. what i am afraid of is that once i go back to work, once i reintegrate myself into society, once i start taking public transportation, that on my first week of work, i will suddenly be hit with all sorts of diseases because my body hasn't built up any immunities against these foreign invaders. i'll be sure to let my future boss know about the potential for a viral meltdown. manny came over tonight to do our christmas present exchange (he had left his presents for me here at my place prior to christmas, i had just recently wrapped up my present for him), but ended up staying for dinner. tonight i was making buddha's turkey delight, fried rice so good that buddha himself, a devote vegetarian, would want to sample it. basically my leftover christmas turkey meat combined with rice and green peas and eggs and a sautee of onions and garlic. manny watched while i cooked, feeding me valuable cooking advice. i also made some instant tom yum guy soup (it was very difficult, it involved heating a packet of soup in boiling water) and fruit elixirs for the both of us. because i only have a small frying pan, i had to cook the ingredients first before putting that into a mixing bowl so i could fry the rice. we ate in the living room, watching fear factor. i was waiting for the part in the end where they eat bull testicles, but this was the fearlessest episode of fear factor ever, the challenges were going through a maze filled with attack dogs, standing in a room full of riot gas, and driving a car up a moving vehicle convey truck. luckily, lord of the rings was playing on one of the movie channels and we switched back and forth. after dinner, we watched a bit more of LOTR, manny explaining to me th finer details of middle earth (having read the books himself). after he checked his voicemail, he had to leave, but not before we quickly opened up our presents, i giving him a silver/copper indian hanging keyholder with an elephant motif, while he gave me a digital desk clock that doubles as a thermometer/timer/world time when you flip it on its various sides, and also an ikea stråla lamp, three table lanterns of diminishing sizes strung together. once manny left, i assembled the stråla. unfortunately it uses small candelabra based light bulbs, which i had none, so i quickly ran next door to buy a pack along with half a dozen rolls of toilet paper. walking back home i couldn't help laughing for some reason, clutching the package of toilet paper in one hand, light bulbs in the other. it seemed so domestic, and i take great joy in these little things, having lived a sheltered life, and not really having to ever consider that things like light bulbs and toilet paper just don't magically grow on trees. the bulbs i got were these tiny 7w bulbs for a combined wattage of 21w, almost like three candles. they look festive on top of my bookcase in the living room. into the bathroom went the toilet paper, my stock replenished, no longer having to ration my last roll of tp. life can not get any better than this.